This week’s reading selection kept to our “Month of Holiday” theme for the month of December, but approached it in a pretty different way. The book for this week was a collection of stories addressing a more mystical side of life (and Hot Chocolate is totally appropriate for this month’s theme), and is entitled Hot Chocolate for the Mystical Soul by Arielle Ford. Okay – I’m not one for being inspired by the “inspiring” stories of others. I read ONE Chicken Soup for the Soul book, and it was not really my cup of tea. I have a hard time finding any kind of inspiration from other people’s experiences, and it leaves me rather empty. I’d rather spend my time reading some great historical fiction. This book, however, piqued my interest. Hot Chocolate for the Mystical Soul includes 101 stories from people of different backgrounds, religions, races, countries, and upbringings, who have all had experiences with the otherworldly. This book included some pretty amazing stories – some unbelievable, some really heartwarming, and still some rather touching! My favorite story was one of a man who had a 4 year old girl who was interested in Egypt. He received an invitation to do a guest speech in Egypt, and was told to bring his family. He was given a business sponsor who also had a young daughter (5). When the two girls saw each other, they ran into each others’ arms, hugged, and both said, “I’m so happy to see you again.” These young girls had never met. This story inspired some really poignant feelings in my heart and soul, because I believe in soul mates, and I don’t think they are necessarily romantic soul mates, simply people who have been in your past life, and who are now present in this life. This book was full of these kids of amazing experiences, which kept me reading into the late hours of the night. My favorite aspect of this book was that you could never really get bored – each story was only a page long (maybe 5 tops), and every one was different! It was wonderful to hear from people from different countries who all had different belief systems, and yet they all had these otherworldly experience. For me, this shows how we are all cosmically connected, regardless of our backgrounds, distances, or beliefs! I would recommend this book for anyone with an open mind. I will probably be passing this one on to my mom, who I know will appreciate it. It’s good for some light reading, and interesting even if you only have a few minutes at a time to read (because you can fit in one or two stories at a time). I probably won’t be picking up many more “inspiring” books, but I’m glad I read this one. That was the point of this book challenge – to expand my reading horizons! Are you a fan of these kinds of “personal inspiring stories” books? Do you believe in otherworldly experiences? Have you ever had an otherworldly experience? So sorry for the late post. My family and I had a VERY BIG weekend. Friday my husband and I went to see The Hobbit: The Desolation of Smaug, Saturday I went with my family and my friend Anna (and her family) to a beautiful Christmas event at a historic home (the Royal Governor’s mansion in North Carolina – Tryon Palace), and Sunday my two little girls had a Christmas recital. They are such great little ballerinas, and I was such a proud mom. With all that excitement, I forgot to write about this week’s reading, which is the 16th of our “52 Books in 52 Weeks” challenge. This week, we are keeping with December’s “Month of Holiday” theme by picking up something a little out of the ordinary. 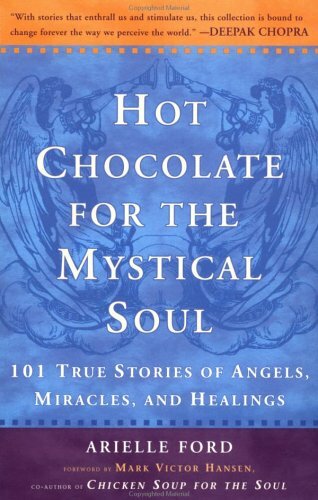 The selection is Hot Chocolate for the Mystical Soul: 101 True Stories of Angels, Miracles, and Healings by Arielle Ford. This book is a collection of stories about… well… angels, miracles, and healings. I found it in the “New Age” section of my local used book store, when trying to find something about how Yule (this Saturday!) inspired Christmas traditions, but no such luck. As I said at the beginning of this month, there was a woefully small amount of books embracing any other religion besides Christianity in this town (but what should I expect, here in the Bible Belt), and I had a hard time finding any “Holiday” related books that weren’t about Christmas. I saw this book, and thought “Hot Chocolate is holiday related,” and that thought – coupled by my desire to at least attempt to acknowledge there are other holiday celebrations going on this time of year – lead to me buying this one. The $4.88 price tag didn’t hurt, either. I hope you’ll read along with me as we tackle this interesting book. Listen – it could be a MAJOR flop… it could be boring as can be, but I’m excited to give it a chance!